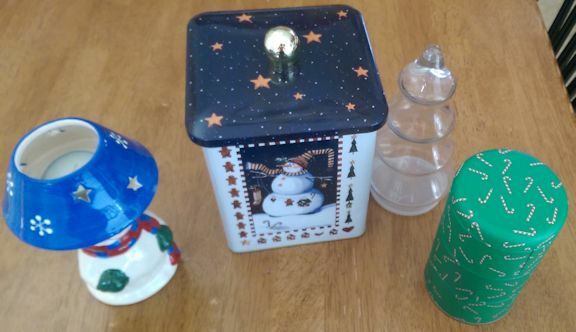 Even though I’ve never devoted a lot of time and energy to holiday decorating, I somehow ended up with random Christmas items scattered around my house anyway. They took up residence at the back of cabinets, on the top shelf of the pantry, and other places where I hadn’t looked in a while. How that happened, I really don’t know… maybe I can blame it on mischievous elves? My usual Christmas decorations, when out of season, are kept neatly boxed up in the basement closet under the stairs. They’re not a problem. But the random stuff hadn’t been used in ages and was just taking up space in my house, pointlessly, and gathering dust. No sense in keeping that! Today is a lovely sunny day, but over the past week there have been a few cloudy days as the weather turns cooler. Like many people, I find that the shorter days tend to affect my mood, leaving me with a dark and oppressive feeling. 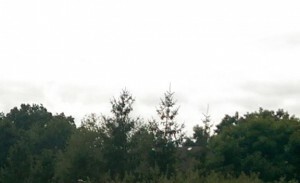 Although the leaves haven’t fallen yet, the sky looked like autumn with its heavy, lingering cloud cover when I took this photo—not a bit of blue anywhere to be seen. After considering it, though, I realized that how I feel about the change of seasons is not outside of my control. The language I use to describe the weather is entirely my choice, and so I’ve resolved not to use words like “dreary” to describe dark cloudy days. When it comes to my mood, that is a self-fulfilling prophecy, and not one that I want to inflict on myself! From now on, if it is rainy or foggy or whatever, I’ll just use that simple descriptive term without adding a negative gloss to it. And if I notice something I like in a fall or winter day, then I’ll say that too! I recently read an article about a “Burger Bot” that is being developed to automate fast-food restaurants. The author lamented that because so much work can be done with machines, it won’t be long before there are no jobs left for real human beings. Of course, that line of thought has been worrying people ever since the Industrial Age got underway. Advances in technology have been displacing large numbers of workers for centuries. Our society no longer needs blacksmiths, carriage makers, or many other occupations that once were commonplace. Most of us don’t live on farms in small towns anymore. So, we have to find a niche in today’s complicated economy, and that’s not easy. Although increased production has made more resources available for new industries to develop, it has been a continuing struggle for this expansion to happen quickly enough to create all the jobs we need. Because of population growth, even in years when many new jobs were created, we’ve always had more workers competing to fill them. Modern transportation and communication technologies have made it possible for companies to move jobs anywhere, bringing even the most remote areas into the global economy. Civil rights laws also have increased the number of people in the workforce—in particular, women. That’s a lot of transitions to deal with at once. No wonder there is so much anxiety among today’s workers. Although lower birthrates will eventually reduce the number of people seeking jobs as the global economy continues to expand, we’re not there yet. I remember taking part in a conversation on a forum about ten years ago, started by a woman who enjoyed having a lot of projects to work on. She wrote that when she reached the end of a project and hadn’t yet moved on to another one, it always left her feeling anxious. “The Betweens” was what she called that feeling—a sense of displacement and uncertainty, wanting to do something more but not knowing what came next. Right now, I would describe our society as mired in the Betweens. Many of the old ways of doing things have outlived their usefulness, but it’s not yet clear what will replace them. All that uncertainty leaves us with vague feelings of impending calamity, as if we need to fix everything right away and it’s going to turn into a huge disaster if we can’t get it all sorted now. But the upside of the Betweens is that they give us an opportunity for valuable reflection, if we can get past the anxiety and look calmly at what’s going on around us. The Betweens are always happening on a smaller scale in our everyday lives, when we finish a task or errand and haven’t yet moved on to the next one. Often we get in the habit of rushing from one thing to another, without taking time to reflect. Even though we may not consciously notice the anxiety, it’s there anyway as we hurry through our days juggling a schedule packed with chores and obligations, getting distracted and annoyed whenever something slows us down. This year I’ve been making an effort to change my perspective—to reframe those small daily moments of waiting in long grocery checkout lines, etc., as natural pauses in life’s busy flow and to practice mindfulness when they occur. I want to appreciate the Betweens, to cherish them—to feel grateful for the little unplanned gifts of grace with which they bless my life. Having time to slow down, get my thoughts in order, and be present in the moment really is a blessing, even in the checkout line! And I am hopeful that our society will develop more creative appreciation for the Betweens, too. Changes and transitions aren’t necessarily bad; we just need time, perspective, and mental energy to deal with them. We have so much power to shape both our personal lives and the world around us into better and healthier patterns, but first we need to take enough time to consider where we want to be! As workforce growth slows in the coming decades and the global population begins to drop, we’ll likely find ourselves in a much-changed world where companies struggle to cope with persistent labor shortages. Industries that rely on having large numbers of unskilled low-wage workers, such as fast food, will crash unless automation can fill the gap. I believe it’ll turn out to be very good for future workers, having Burger Bots make their lunches while they pursue better-paid and more interesting careers. I’ll also note that although the Millennial generation often gets criticized for having a sense of entitlement, they generally understand that they are in control of their own lifestyles and career choices. We could all use more of that. Autumn is, among other things, the season when holiday food gift catalogs show up in the mail. The cookies and cakes are so creatively decorated, looking at them can be as much fun as eating them! 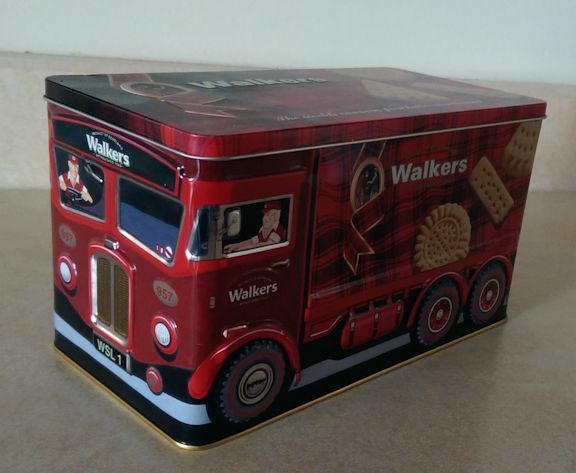 My sister bought Christmas cookies for my family one year, which were shipped in a holiday tin decorated like a delivery truck. 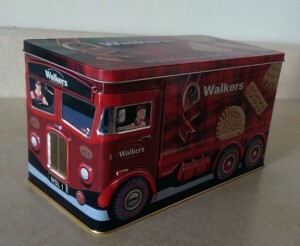 The cookies were yummy, and the tin was just too cute to throw away—well, you know how that goes. For more than a decade, the empty cookie tin sat on the top shelf of a kitchen cabinet. It never got in the way because the shelf is too high to reach without standing on a stepstool, and there wasn’t anything else we wanted to put there; so, at the time, it just seemed like a cheerful decoration. Last year I bought a Hamsa charm, handmade by an artist in Israel, to decorate an interior wall and bring peaceful feelings to my house. The wall, which never gets direct sunlight, looked like it could use some brightening up! 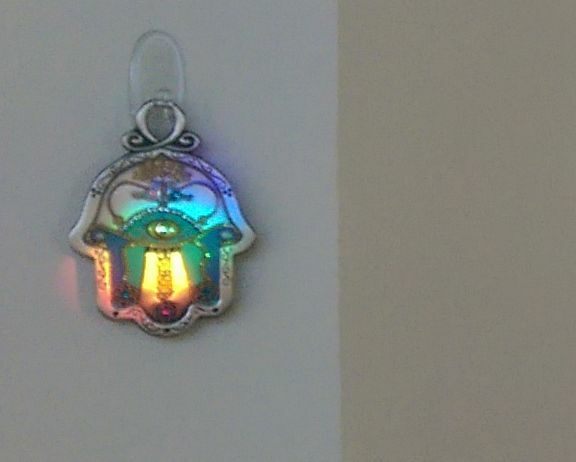 I also hung a small suncatcher in a window, consisting of an angel and a crystal teardrop (shown in this post on a gray winter day). The suncatcher makes tiny rainbows, mostly on the floor. This morning I noticed that there was a rainbow directly on the Hamsa, and took a photo to share. Although it may not seem like much, I’ve found that having little bright cheerful things around the house can go a long way toward keeping me in a good mood generally! We all know how this story goes—exercise equipment is bought with the best of intentions, only to end up in the back of a closet gathering dust. Then we tell ourselves a fairy tale about how it’s still worth keeping because we’re going to use it again someday. Maybe the last time I used these weights was in 2006; I honestly can’t remember, it was so many years ago. And I have no need to keep them because I took up rowing last year, which does a good job of keeping my arms toned. I like getting out on the river and seeing the wildlife—there are herons, ducks, and beavers all along the course. 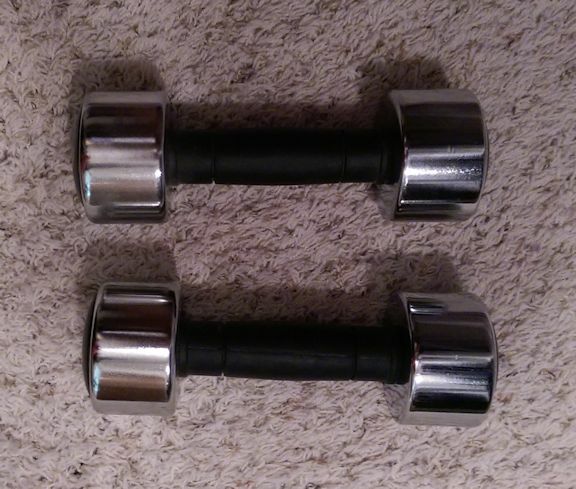 So I’m getting rid of the weights. And I would say there’s a more general lesson here: Why keep old exercise stuff that just gets in the way and gives us bad feelings about not having used it, when the world is so full of other fitness activities we might enjoy a lot more? I’ve never had any furniture in my great room, other than a rocking chair in the corner, and the Christmas tree when in season (it’s artificial, so I suppose it can be counted in the furniture category). The chair matches the woodwork pretty well, but that is just by coincidence. It’s left over from when my kids were babies; I never could bring myself to give it up after they outgrew the need for a nursery rocking chair. The window shown in this photo is part of a set of lovely tall windows along the back of the house, facing south-southeast. I didn’t want to put any furniture on that wall and block the gorgeous morning light. 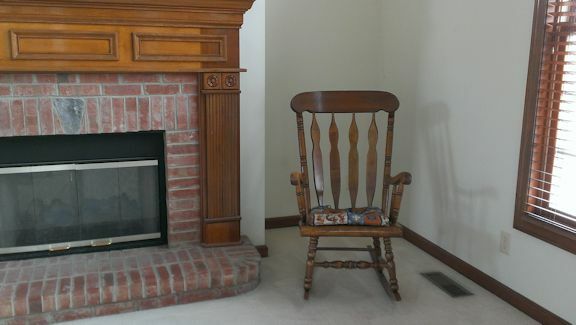 On the side of the room opposite the fireplace, there is a partial wall dividing the great room from the kitchen; it’s too short to put any sizable furniture along it. The only other wall is the one across from the windows, and we always walk close to that wall when going to and from the kitchen, so putting any furniture there would seriously disrupt our usual traffic pattern. The room always felt perfectly comfortable without furniture. On winter nights, we sat on the floor playing Monopoly next to the cheerful lights of the Christmas tree. In the summer, when we had cookouts, there was plenty of space for guests to walk around. Projects could easily be spread out on the floor and assembled. But in the back of my mind, I felt guilty for having failed at decorating because I didn’t have a properly furnished house like my mom always had. This year, I’ve put a higher priority on self-nurturing, along with reading some blogs and books about minimalism. And I have decided to give myself permission to keep my house a comfortable place for my family, even if it might not look like a decorator’s showplace. What really matters is how we feel when we’re at home! We have awesome personal power, even though we may not fully realize its extent. The small choices that we make as we go through our days ripple outward, touching others around us—and indirectly, others around them—in a cascade of consequences. With this power comes responsibility. In today’s busy world, where we encounter so many decision points, it’s easy to become overwhelmed by anxiety about making wrong choices. Having to foresee all the consequences of our everyday actions seems like a huge burden; and we know there’s no way we could do it perfectly, no matter how hard we might try. So, all too often, we punt. Instead of doing the hard work of making decisions, we let things pile up while we distract ourselves with habitual comfort behaviors, which turn into addictions when they reach the point of seriously interfering with our responsibilities. When we’re addicted to negative thinking, it’s much easier to complain about what others are doing wrong, rather than taking a hard look at ourselves and becoming aware of our own shortcomings. That basically boils down to not being a wuss. A past incident of acting like a jerk generally calls for a direct apology for acting like a jerk, as opposed to leaving an anonymous note in the person’s mailbox or asking a mutual friend to pass on a message. Sometimes it’s not possible to make amends, especially in the context of online negativity. We may regret having treated someone unkindly in a forum discussion several years ago, for instance; but the forum has been closed for a long time, and we have no idea how to contact the person anywhere else. Or maybe it was the sort of online community that’s always full of flame wars and random nastiness. If so, it’s probably best avoided regardless of who might still be there, for much the same reasons that an alcoholic probably shouldn’t go into a bar to apologize for having been rude to a drinking buddy. Good intentions tend to get overcome by familiar bad influences, which is why judges imposing probation conditions generally hand down a long list of bad influences to avoid. And sometimes people are so suspicious that an unexpected kind message can cause more harm than good. I know a woman who tried to smooth things over after an online argument by sending a friendly email to one of the people involved, mentioning that she had noticed he lived very close by and their families were neighbors. Instead of giving her a neighborly reply, he publicly accused her of stalking him and threatening his family. I’m not suggesting that it is always best to be exceedingly cautious online, avoiding all contact with anyone who might possibly hold a grudge. Still, it’s wise to exercise a healthy degree of caution. Click here to read Recovering from Negativity, Step Ten.